A veteran hydro worker in southwestern Ontario was electrocuted while repairing damage caused by Sandy, as Canadians clean up from the weakening post-tropical storm that continues to swing east, bringing with it heavy rainfall and strong winds. Police say the accident occurred on a residential street near the Lake Huron shoreline in Sarnia, Ont., around 10:15 a.m. The identity of the worker, who worked for local utility Bluewater Power, was being withheld until the family has been notified. The Ontario Ministry of Labour told CBC News the worker was electrocuted while trying to fix downed power lines. "It is devastating because the community was so proud of the fact that there had not been anyone injured during the storm and that we'd come through it as a family," said Sarnia Mayor Mike Bradley, adding that Bluewater crews were "working around the clock keeping the city functioning." Janice McMichael-Dennis, the president and CEO of the local utility, also gave her condolences, saying the tragedy had cast a pall over an already trying situation as Bluewater employees race to restore power to homes. "For our one of our linemen's family it's a devastating loss," she told CBC News. "Certainly I'd be amiss to even think that any words could be even adequate to express…the grief with our family here at Bluewater Power and the grief that's with his family." This is the second fatality as a result of the storm after a Toronto woman was killed Monday night when she was hit by a falling sign. The Ontario Ministry of Labour plans to launch an investigation into the worker's death. The Electrical Safety Authority and Sarnia police are also investigating. Ontario Premier Dalton McGuinty said the tragedy was a reminder of the risks that hydro crews face on the job while doing their best to keep customers' lights on. Provincial Energy Minister Chris Bentley also expressed sympathies to the victim's family on Wednesday. "This terrible tragedy shows the dangers that hydro workers across Ontario face every day as they dedicate themselves to delivering and maintaining the electricity that keeps our homes and businesses functioning," Bentley said in a statement. Sandy major surge has come and gone, but weather forecasters say the post-tropical storm will bring rain, cool air and possibly flurries to Eastern Canada on Wednesday as trick-or-treaters participate in their annual Halloween ritual. Southern and eastern Ontario, Quebec and the Maritimes will experience scattered showers to heavy rain, but there may be snow in parts of northeastern Ontario, said CBC meteorologist Jay Scotland. 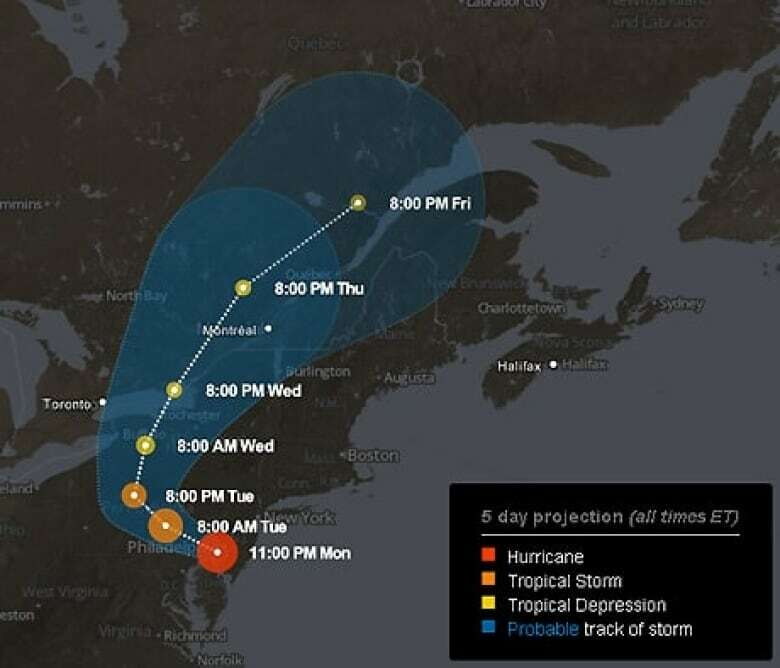 "The remnants of Sandy will continue to spread moisture into cooler air, which means flurries or light snow for some and a messy mix, including freezing rain, for others … the good news is that the worst of the wet and windy weather is behind us," he said. "But cloudy and cool weather will remain in place for trick-or-treating, and parents should be advised to keep the umbrella handy." Cleanup in Eastern Canada continues after the superstorm's unrelenting winds and rain felled trees and tossed debris, leaving as many as 200,000 people without power and killing at least one woman. Recovery efforts are also underway in the northeastern U.S., where Sandy's impact was far more widespread and deadly. The superstorm's lashing winds and storm surges, reaching as much as four metres high, left millions without power and at least 61 dead. Wednesday afternoon, at least 6,000 homes and businesses were still without electricity in northern Ontario, Hydro One said, down from as many as 90,000 a day earlier. 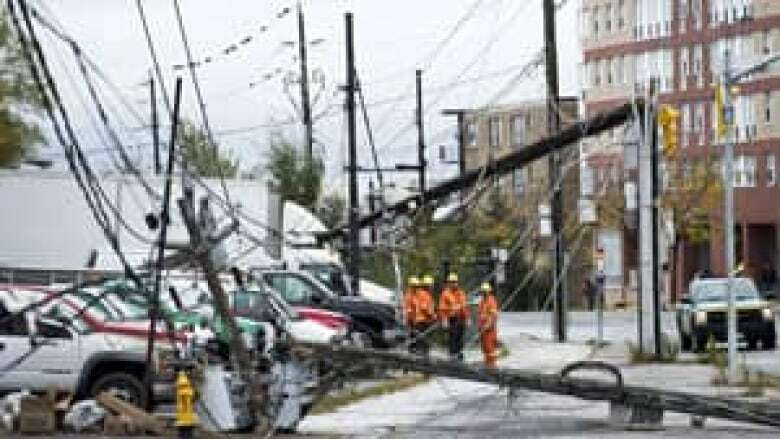 Toronto Hydro reported up to 55,000 people were without power on Tuesday, but by Wednesday morning, electricity had been restored to all but 500 people. "Toronto Hydro estimates that more than 85 per cent of the outages were caused by tree limbs coming into contact with power lines, poles and transformers," it said in a statement. They estimated the cost of storm-related repairs could reach $1 million. Nova Scotia Power was working to restore power to roughly 1,750 people, the majority of which were in Dartmouth, and said it was also sending crews to Connecticut to help with power restoration efforts south of the border. Neera Ritcey, a spokeswoman for Nova Scotia Power, said the utility is hoping all of the electricity will be restored in the province by late morning. "There's been a lot of individual, scattered outages that went on overnight," she told CBC News on Wednesday. "Given the kind of weather they were dealing with, thunder and lightning, obviously they have to ensure that they're working safely and are spending the right amount of time doing the repairs that are needed." The IWK Health Centre, a pediatric and maternity hospital in Halifax, was forced to cancel elective surgeries and non-urgent appointments due to the loss of power and problems running generators. Several areas of Nova Scotia were forecasted by Environment Canada to receive 30-40 millimetres of rain throughout the day. The agency said the northwestern tip of the province would be hammered by winds gusting up to 90 km/h tonight, before tapering off before dawn Thursday. Scotland said Sandy has grown in size, but weakened considerably in intensity. "The biggest threats from Sandy today will be some heavy rain continuing today for the Maritimes and parts of eastern Quebec with 30 to 50-plus millimetres possible," he said. Environment Canada said the Charlevoix region northeast of Québec City had already received 143 millimetres since Monday. Farther east in the Martimes there is a chance of thunderstorms, and while there is the risk of localized flooding, the weather is "far from extreme," said Scotland. In northern Ontario, the township of Wawa was blanketed with 10 centimetres of snow overnight Tuesday as Sandy moved across the region. The town is under a state of emergency after a severe drenching of rain last week washed-out roads in the area, including a section of the Trans-Canada Highway.